We’ll be brief. Peter Drucker sums it up aptly and succinctly: “The aim of marketing is to know and understand the customer so well the product or service fits him and sells itself.” The better you understand your customer’s thinking, the better you’re able to meet her needs, and the easier it will be to hone in on pricing, marketing, and merchandising. The traditional model of customer behavior takes into account factors like price and the consequences of consumer decisions. However, as David Holdford points out, that model falls apart in practice. Customer decisions often come down to a nexus of economics, social influences, and personal experience — as well as the biases these things bring with them. The picture is further complicated by the circumstances under which someone visits your pharmacy, whether they’re a regular or a new customer, and their susceptibility to things like brand loyalty. Your efforts, then, take place in an environment that’s far less predictable than you’d like. Thankfully, Holdford’s findings contain a bit of reassurance.There’s a three-stage process we can remember, and use not only to influence purchasing decisions but also to cultivate loyalty. During this process, the customer is assessing multiple levels of risk, the perceived importance of the purchase, their level of engagement in the purchase relative to their engagement in their health and care, and the amount of control they feel they have over the process. What lessons can we draw from all of this? To begin with, it’s worth remembering that buying decisions predate your customer’s visit to your pharmacy, and may continue long after they’ve left. It’s also worth bearing in mind that these decisions and considerations aren’t always, or aren’t entirely, conscious. And if we’re paying attention, we can find ways to insert ourselves and our expertise into each stage of the process. Being a trusted source of information, offering a variety of products and keeping them accessible, and — perhaps most importantly — understanding the importance of follow-up as a means of building relationships and trust, can each be ways to guide customer thinking and the behavior that goes with it. How does your pharmacy shelving generally — and Shelving Design Systems particularly — fit into all of this? Your pharmacy layout and design have the ability to guide and reinforce customer behaviors. A pharmacy that’s poorly conceived can send muddled messages, or might reinforce negative perceptions and behaviors. We draw on many years’ experience in pharmacy design as well as our installation expertise, so we can help you keep from making common mistakes in your merchandising, displays, and the messages they send. 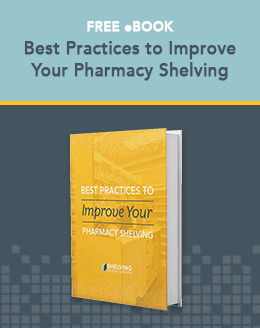 See how we can help with your pharmacy shelving needs today!